To Cite: Tkachenko O, Shchekochikhin D, W. Schrier R. Hormones and Hemodynamics in Pregnancy, Int J Endocrinol Metab. 2014 ; 12(2):e14098. doi: 10.5812/ijem.14098. Context: Normal pregnancy is associated with sodium and water retention, which results in plasma volume expansion prior to placental implantation. The explanation offered for these events is that pregnancy ‘resets’ both volume and osmoreceptors. Evidence Acquisition: The mechanisms for such an enigmatic ‘resetting’ in pregnancy have not previously been explained. However, recent human pregnancy studies have demonstrated that the earliest hemodynamic change in pregnancy is primary systemic arterial vasodilation. 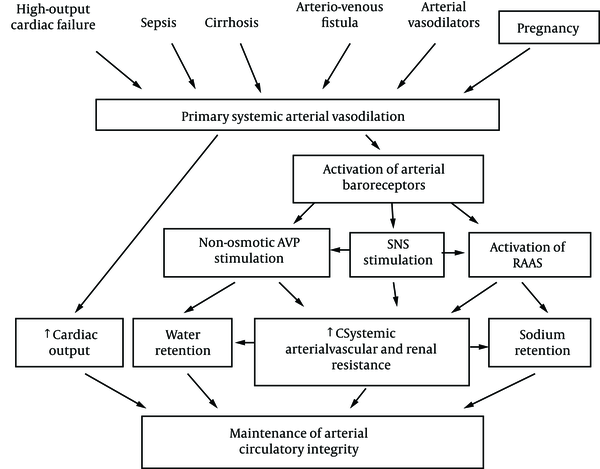 This arterial underfilling is associated with a secondary increase in cardiac output and activation of the neurohumoral axis, including stimulation of the renin-angiotensin-aldosterone, sympathetic, and non-osmotic vasopressin systems. 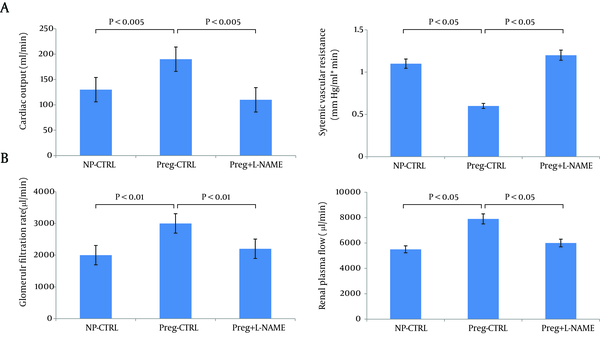 Resistance to the pressor effects of angiotensin and sympathetic stimulation in pregnancy is compatible with an increase in endothelial nitric oxide synthase activity. Figure 1. Body Fluid Regulation in Health and Disease: A Unifying Hypothesis., Renin-Angiotensin-Aldosterone System (RAAS); Sympathetic Nervous System (SNS). Reproduced with Permission from Ref. 19. Figure 2. Ten Women Studied in the Mid-Follicular Phase of the Menstrual Cycle and Weeks 6, 8, 10, 12, 24 and 36 Gestation. Reproduced with Permission from Ref. 1. Figure 4. 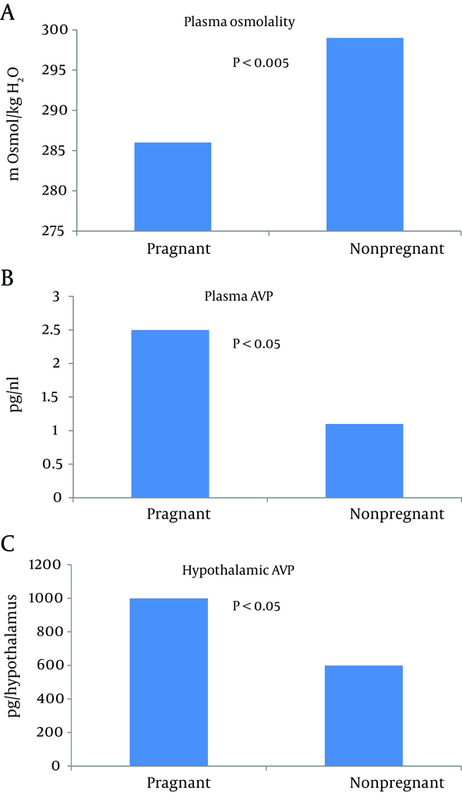 Hypoosmolality in Pregnancy (A) Associated with Increased Plasma Arginine Vasopressin (AVP) (B) and a Rise in Hypothalamic AVP (C). Figure 5. 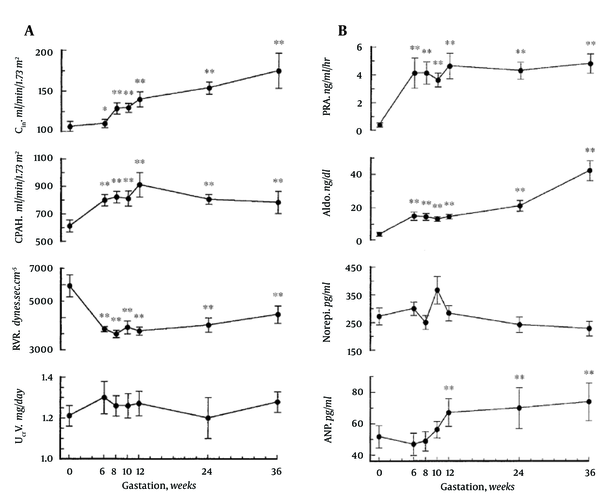 Chronic Nitric Oxide Synthase (NOS) Inhibition Returns Cardiac Output (CO) and Systemic Vascular Resistance (SVR) in Day 14 Pregnant Rats to Nonpregnant Levels. Implication for health policy makers/practice/research/medical education: This article reviews the normal physiology of pregnancy relative to early systemic arterial vasodilation. Previous studies about pregnancy have been performed in the rat; therefore studies on the normal physiology of human pregnancy are pivotal in understanding the pathophysiology of preeclampsia/eclampsia. This has many implications for health policy, education, and research since preeclampsia/eclampsia is the major cause of morbidity and mortality in pregnancy for both mother and child. There is also a need to understand the causes and potential prevention methods of endothelial damage in preeclampsia/eclampsia in order to attenuate such complications. Authors’ Contribution: Drs. Tkachenko and Schrier were responsible for the design of the article; collection, management, and analysis of the data; and preparation, review, and approval of the manuscript. Dr. Shchekochikhin contributed in the design, preparation, and review of the manuscript. Financial Disclosure: The authors confirm no conflict of interest in this article content. Funding/Support: The funding organization is a public institution with no role in the design and conduct of the study; collection, management, and analysis of the data; or preparation, review, and approval of the manuscript. Dr. Tkachenko acknowledges support from the International Society of Nephrology.